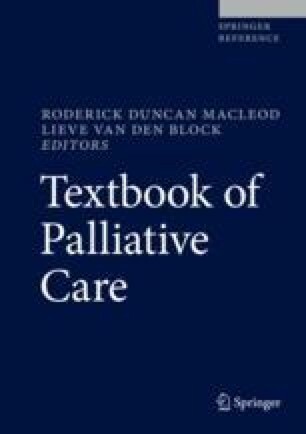 Acute pain syndromes in palliative care are predominantly malignant in origin. These are often emergencies due to the severity of the pain, its meaning to the patient, the disruption of ongoing curative treatment, and the resultant erosion of quality of life. A prompt accurate pain assessment is a vital component of clinical management, followed by analgesic intervention and attention to the physical, psychological, social, and spiritual aspects of pain. Clinicians should develop excellent communication skills to support patients, their families, and also other healthcare professionals in the delivery of optimal care. Pain will not always be managed according to the expectations of others, and so how we deliver care and explain the limitations of treatment is important. Acute cancer pain that is not managed well can become chronic in nature. The development of chronic pain can greatly reduce the functional ability and mood of patients over time. As with all symptoms, managing the acute presentation should lead to an investigation of causative factors, mechanism of pain, and potential therapeutic interventions. Acute pain syndromes can be approached via two causative mechanisms: treatment-related pain and pain directly related to the cancer process. A multimodal and multidisciplinary approach to treatment is often required to not only help the patient, but also to support the family during an uncertain and unsettling period of care.